The traditional "Gruiformes" constitute a polyphyletic taxon (Chap. 3), but current analyses congruently support a sister group relationship between the Ralloidea and Gruoidea, i.e., the clades (Rallidae + Heliornithidae) and (Psophiidae + (Aramidae + Gruidae)) (Livezey 1998; Cracraft et al. 2004; Ericson et al. 2006; Fain et al. 2007; Harshman 2007; Mayr 2008b). These taxa are referred to here as "core-Gruiformes." 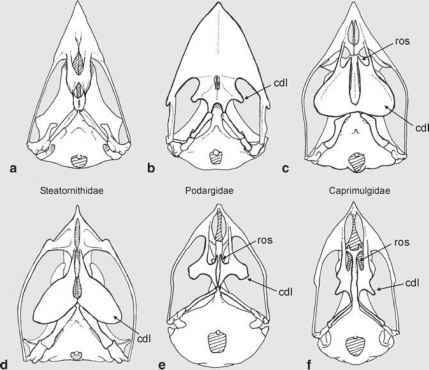 Mainly because of the apomorphic morphology of the aquatic Heliornithidae, it is difficult to characterize this clade with morphological apomorphies. However, most of its representatives exhibit supraorbital processes (skull), a very narrow sternum, and a derived pelvis morphology (Mayr 2008b). The "core-Gruiformes" have a comparatively rich Paleogene fossil record, but many species are based on fragmentary remains, which do not allow a reliable identification.